Europe sees the U.S. as high-handed, unilateralist, and unnecessarily belligerent; the U.S. sees Europe as spent, unserious and weak. The anger and mistrust on both sides are hardening into incomprehension. European leaders, increasingly disturbed by U.S. policy and actions abroad, feel they are headed for what the New York Times (July 21, 2002) describes as a “moment of truth.” After years of mutual resentment and tension, there is a sudden recognition that the real interests of America and its allies are diverging sharply and that the transatlantic relationship itself has changed, possibly irreversibly. Europe sees the U.S. as high-handed, unilateralist, and unnecessarily belligerent; the U.S. sees Europe as spent, unserious and weak. The anger and mistrust on both sides are hardening into incomprehension. This past summer in Policy Review, Robert Kagan reached into this impasse to force both sides to see themselves through the eyes of the other. Tracing the widely differing histories of Europe and America since the end of World War II, he makes clear how for one the need to escape a bloody past has led to a new set of transnational beliefs about power and threat, while the other has evolved into the guarantor of the “post-modern paradise” by dint of its might and global reach. "The best-known and most comprehensive analysis of divisions between the United States and Europe..."
"A seminal work in the tradition of Fukuyama's The End of History, Huntington's Clash of Civilizations, and Kaplan's The Coming Anarchy...it will be a classic for years to come." 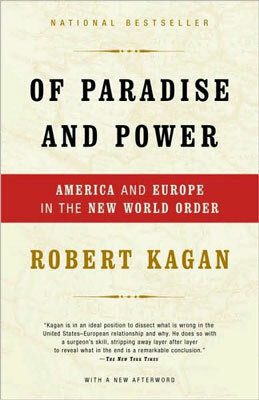 "There is great intellectual pleasure to be gained from the originality and clarity of Robert Kagan's "Of Paradise and Power". "This brilliant and controversial work belongs in all library collections."